I went to a café that had a “We <3 Bitcoin” sticker prominently displayed at the check-out counter. This piqued my curiosity, and naturally started a conversation with one of the employees to learn more about how they accept Bitcoin. I found out that they haven’t taken a Bitcoin payment in over a year! Also, that only one employee besides the business owner knows how to process a Bitcoin payment; and the tablet they have the app on needs to be retrieved from the manager’s office. If this café had Graft at their POS terminal, this scenario would not have happened. The first step to mass integration and acceptance of cryptocurrency is via ease of use provided from companies that provide the infrastructure for these payments to happen effortlessly alongside cash and credit cards. How does GRAFT solve this problem? GRAFT has both the merchant and customer covered. They know that part of the process beyond a merchant downloading a free app for their Verifone or Ingenico POS terminals, isn’t just build it and they will come. 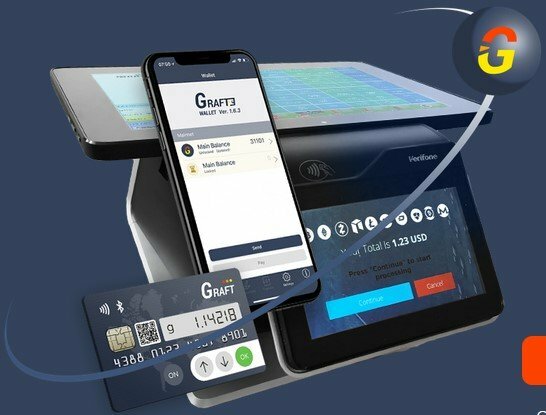 GRAFT has two apps available on both Android and iOS for customers. Surprisingly, it’s not easy to find places that accept cryptocurrency! Trust me, first hand experience! This app allows merchants to update information about their business accepting crypto. This is bound to help cryptocurrency customers find their services. “Cryptocurrency is becoming a widely accepted form of storing value. One of the biggest challenges is making that value easier to spend for day to day items. Stores already have POS machines, but have a hard time adapting their businesses to accept cryptocurrencies. The biggest difference between cryptocurrency and credit cards are their network transaction processing structures. Many legacy transaction processing structures have been very effective at running monopolies. As I’ve dug into learning about financial technologies I’ve heard many first hand accounts about how lucrative these legacy networks have been. A merchant in California who runs a successful skin care clinic pays up to $10,000 a month to credit card companies because the 2-3% fees for every transaction add up! GRAFT for their RTA (real time authorization) transactions keeps the fee at 0.5% for all transaction volumes, this is plus 0.25% to 0.75% for SLA & services. What are RTAs Real Time Authorizations? Paying with Bitcoin means waiting about 30 minutes or 6 blocks for a confirmation that the transaction has cleared. Although long confirmation times are also experienced using other cryptocurrencies. Cryptocurrency is a new field and GRAFT has researched the best approach to achieving RTA. Also from a customer standpoint as someone in the cryptocurrency community, we definitely talk about supporting the local merchants in our community. Take a look at GRAFT's website or read their Whitepaper! Nicole Villa researches almost exclusively about education for mainstream cryptocurrency adoption. CEO & Founder of CoinSailor. A web site that allows users to answer questions about their preferences to get free cryptocurrency matches. Currently in Puerto Rico continuing her research & work.